Download "OSes. Arvind Seshadri Mark Luk Ning Qu Adrian Perrig SOSP2007. 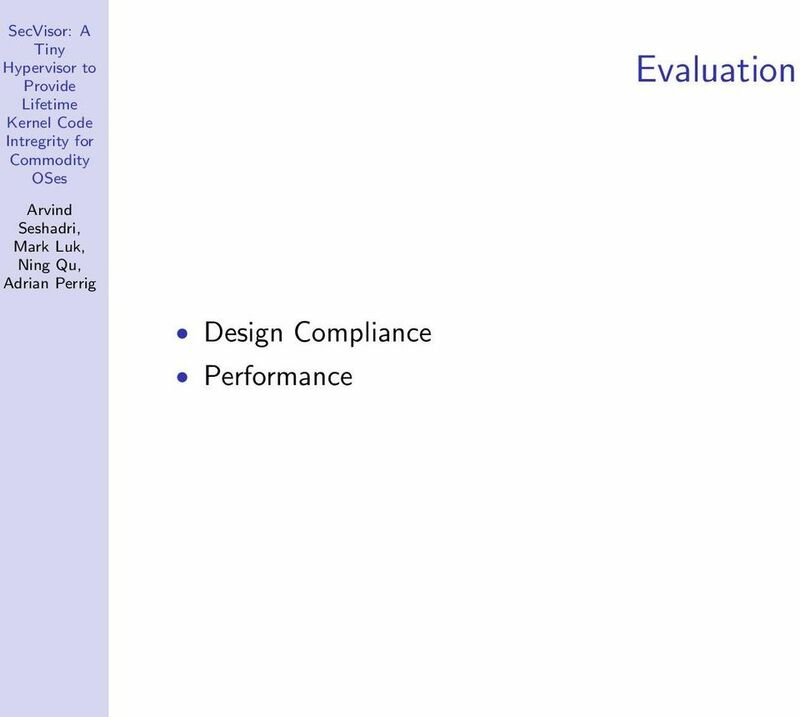 CyLab of CMU. 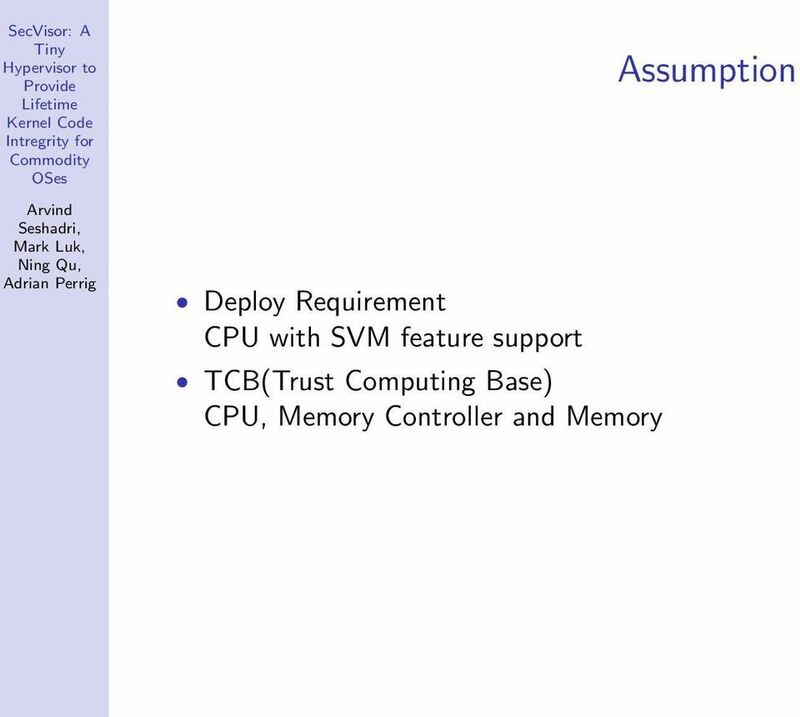 SecVisor: A Tiny Hypervisor to Provide"
8 Background of Background TLB(hw): A Translation Lookaside Buffer (TLB) is a CPU cache that is used by MMU to improve the speed of virtual address translation MMU(hw): A memory management unit (MMU) is a computer hardware component responsible for handling accesses to memory requested by CPU Page Table(OS):A page table is the data structure used by a virtual memory system in OS to store the mapping between virtual addresses and physical addresses When CPU send out the request to memory, will first check TLB. 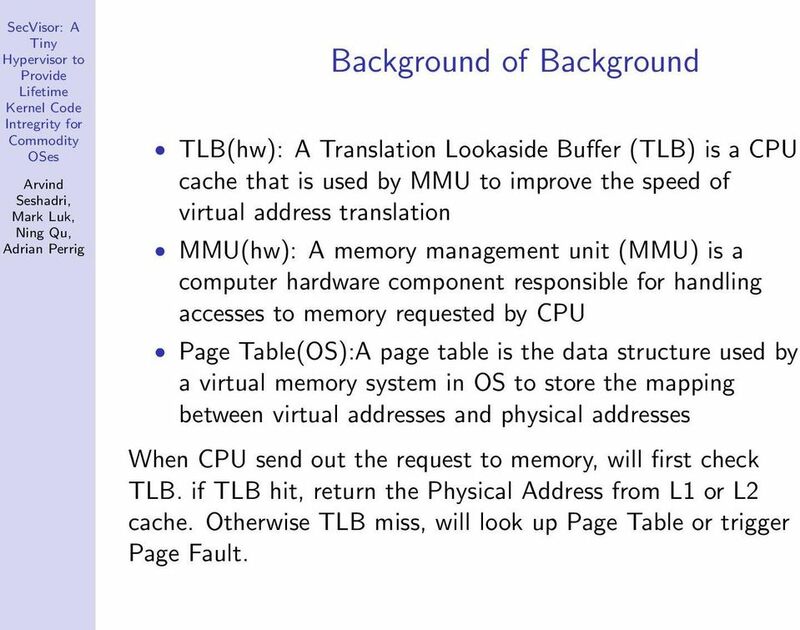 if TLB hit, return the Physical Address from L1 or L2 cache. Otherwise TLB miss, will look up Page Table or trigger Page Fault. 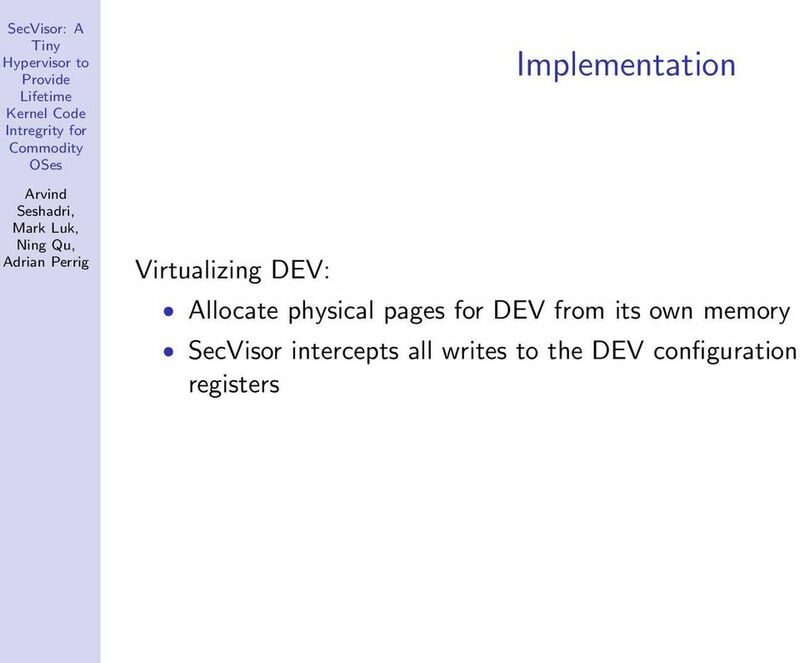 9 Design Problems How to protect SecVisor itself? 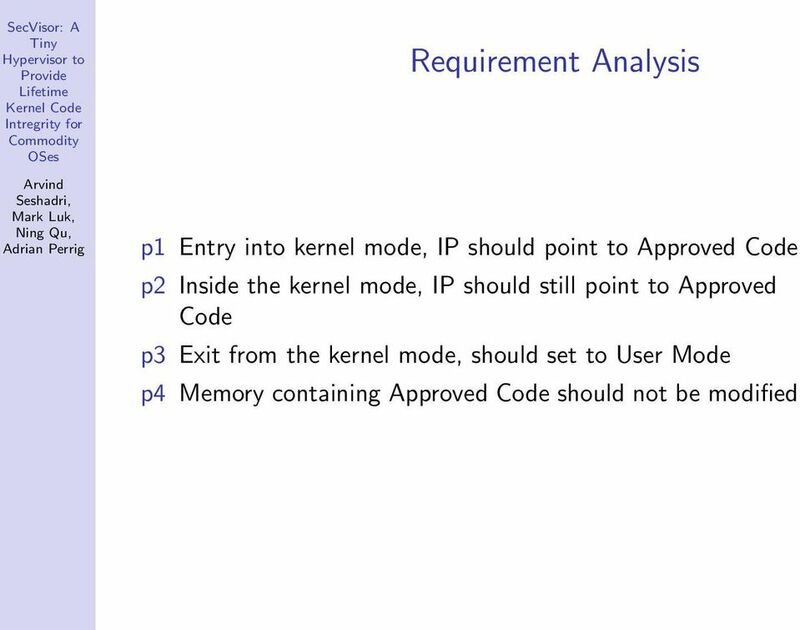 How ensure only approved code executes in kernel mode? 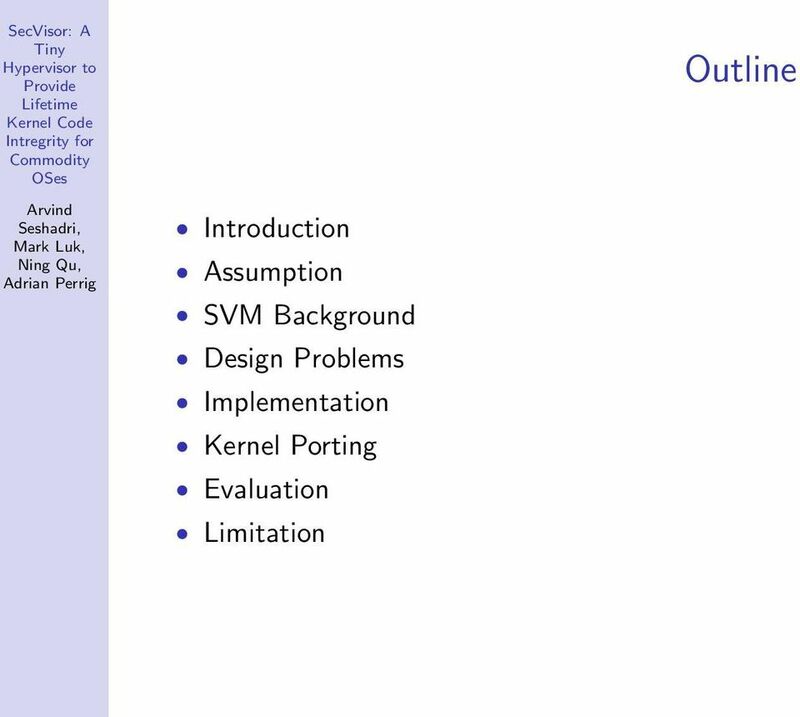 How ensure the Kernel-User Mode switch? 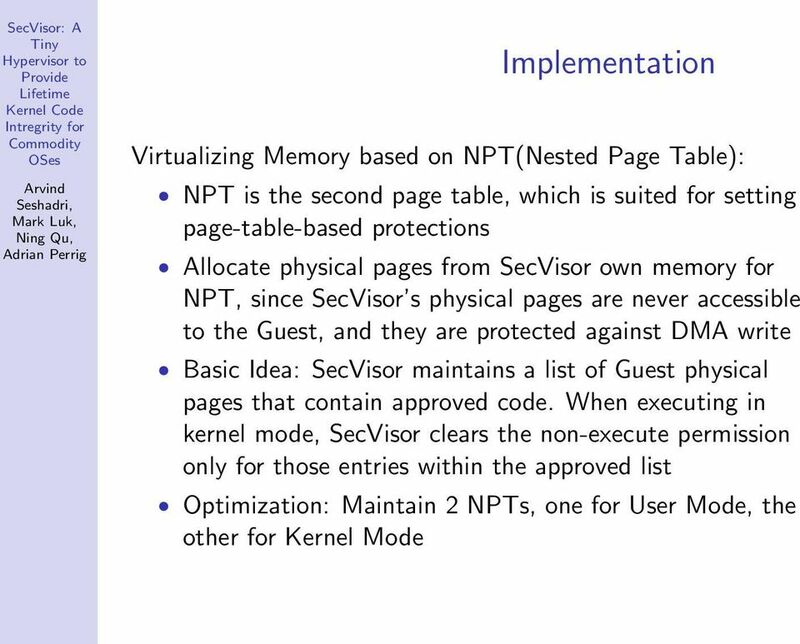 14 Implementation Virtualizing Memory based on SPT(Shadow Page Table): SPT modify execute permission over user and kernel memroy on each mode transition SPT maintains the mappings between virtual and host physical address, synchronize with the Page Table(OS Kernel) by intercept triggered by Page Table related operations, e.g. modify page table, handle page fault. 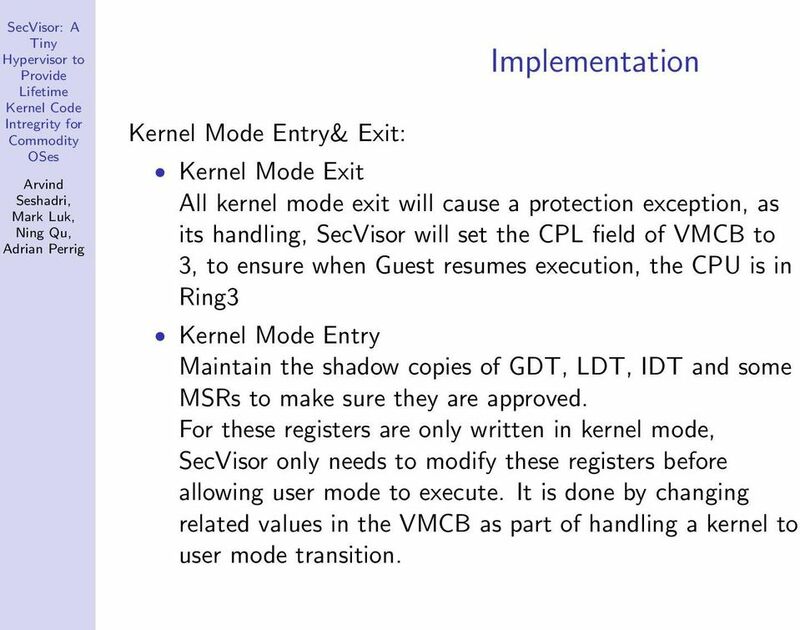 16 Kernel Mode Entry& Exit: Implementation Kernel Mode Exit All kernel mode exit will cause a protection exception, as its handling, SecVisor will set the CPL field of VMCB to 3, to ensure when Guest resumes execution, the CPU is in Ring3 Kernel Mode Entry Maintain the shadow copies of GDT, LDT, IDT and some MSRs to make sure they are approved. 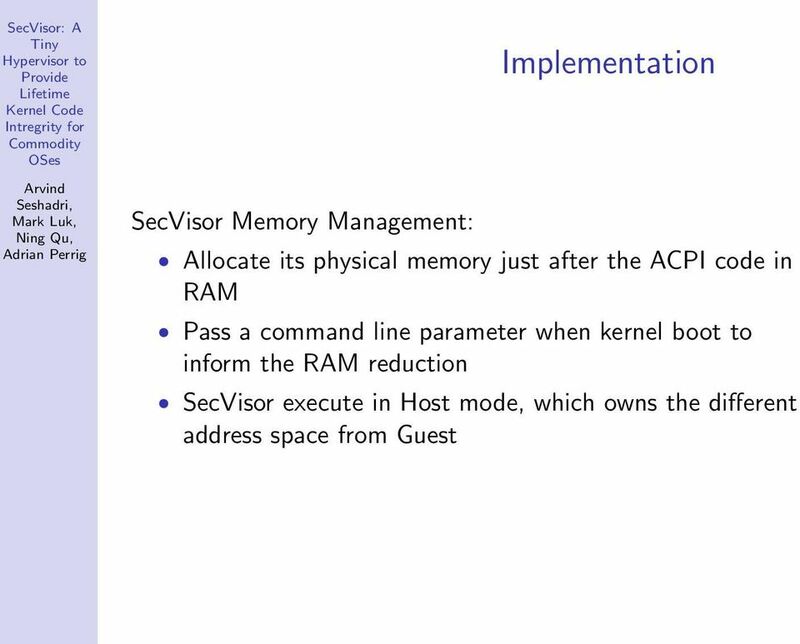 For these registers are only written in kernel mode, SecVisor only needs to modify these registers before allowing user mode to execute. 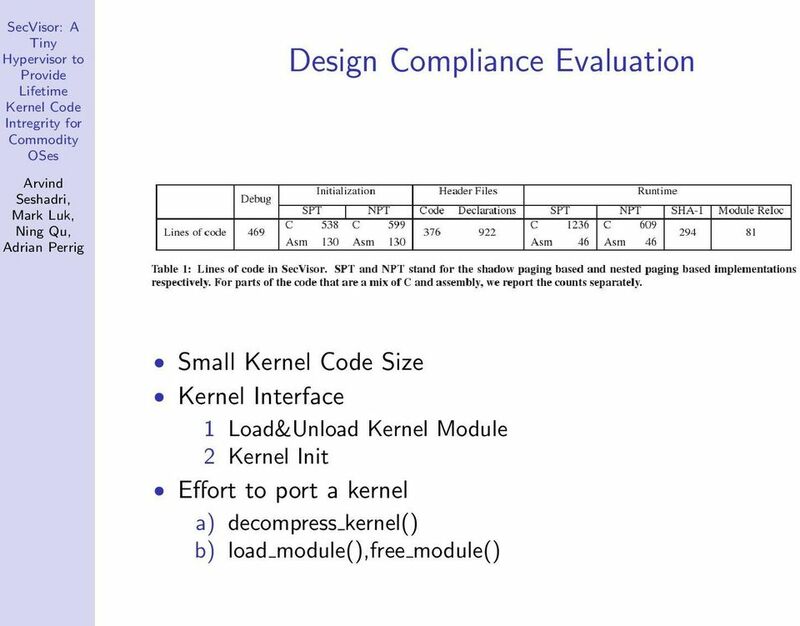 It is done by changing related values in the VMCB as part of handling a kernel to user mode transition. 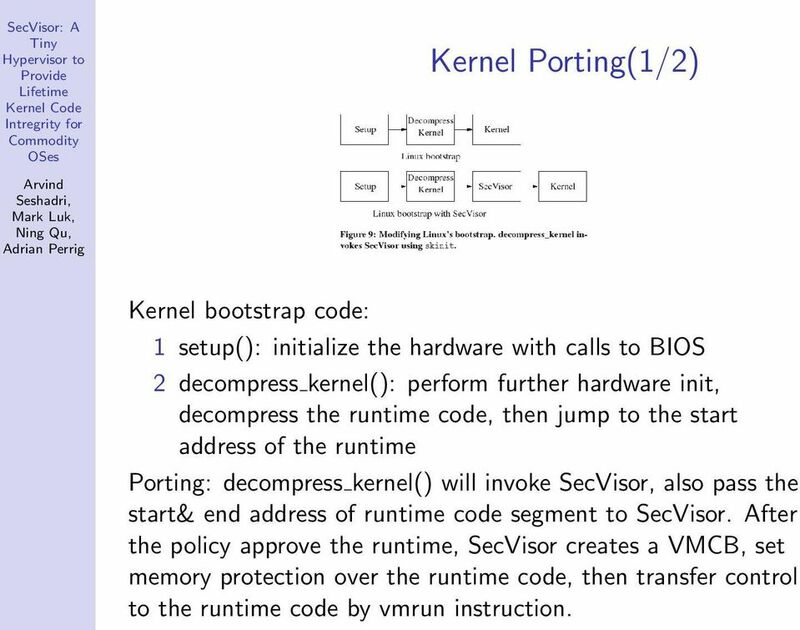 17 Kernel Porting(1/2) Kernel bootstrap code: 1 setup(): initialize the hardware with calls to BIOS 2 decompress kernel(): perform further hardware init, decompress the runtime code, then jump to the start address of the runtime Porting: decompress kernel() will invoke SecVisor, also pass the start& end address of runtime code segment to SecVisor. 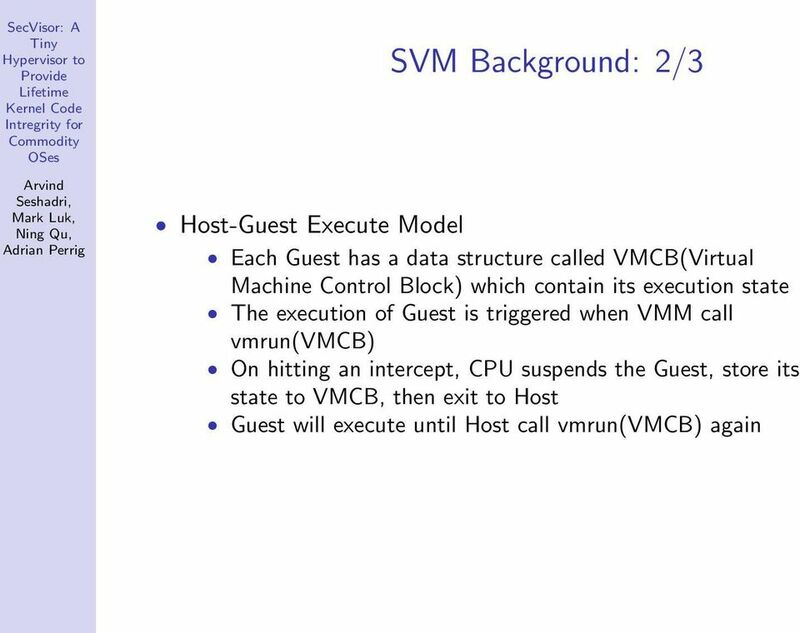 After the policy approve the runtime, SecVisor creates a VMCB, set memory protection over the runtime code, then transfer control to the runtime code by vmrun instruction. 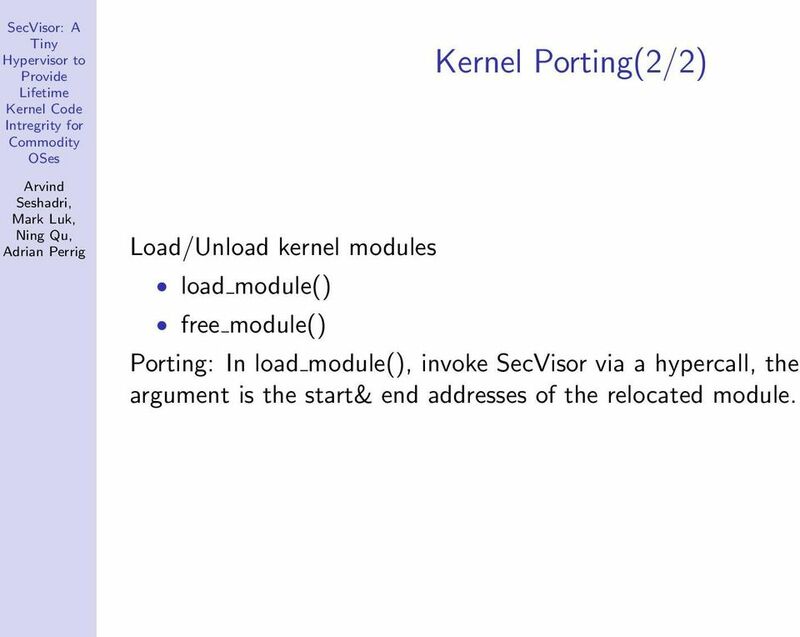 18 Load/Unload kernel modules load module() free module() Kernel Porting(2/2) Porting: In load module(), invoke SecVisor via a hypercall, the argument is the start& end addresses of the relocated module. 25 SecVisor: A Q&A Thank you. Any questions?